Section your hair and cleanse with the Eden BodyWorks Coconut Shea All Natural Shampoo, concentrating on the scalp. Apply the Eden BodyWorks Coconut Shea All Natural Hair Masque and detangle. Cover with a conditioning cap and let it sit for 15 min. Rinse and plop with a t-shirt to absorb most of the water. This will take about 10 min. Apply a small amount of the Eden BodyWorks Coconut Shea All Natural Hair Oil in each section. Blow-dry your hair from ends to the roots using a comb attachment or a vented paddle brush. Create a small section and comb it from ends to roots with a small tooth comb. Apply a small amount of the Eden BodyWorks Coconut Shea All Natural Curl Defining Crème to the section. Avoid saturating the hair with the product, as you do not want the hair to revert. 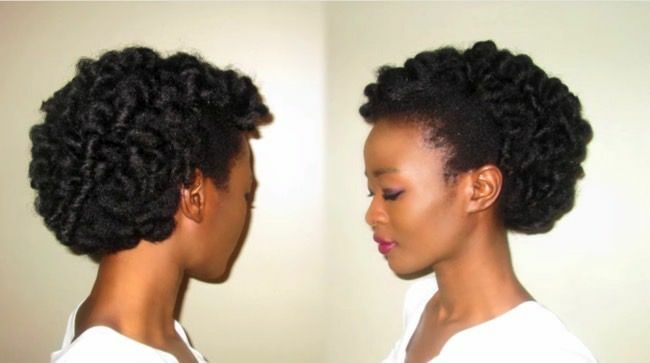 Hold the hair taut, place a cold perm rod at the ends, and roll it up toward the scalp and secure. Sit under a hooded dryer for an hour or sleep with the rollers in overnight. Remove the rods carefully and separate each section for the desired volume. Remember that the more you separate, the less definition you will maintain, and the shorter the style will lasts. Smooth your hairline with the Eden BodyWorks Coconut Shea All Natural Control Edge Glaze and a boar bristle brush. Secure the sides of the hair toward the middle of the head like a mohawk. Tuck and pin your ends where you desire. Editor's note: This is not sponsored.